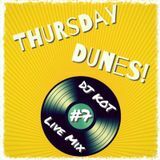 Dunes Thursday №7 - dj KoT - Vinyl Live Mix! Don&apos;t call me friend, don&apos;t call me brother. &apos;Cause you don&apos;t know me.